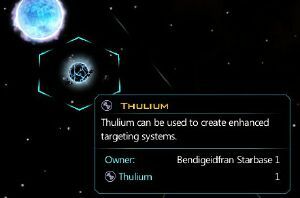 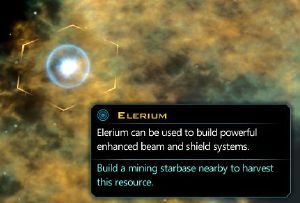 Galactic resources are a type of resource found throughout the galaxy. 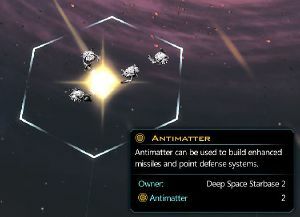 They are mined by space stations equipped with a mining module. 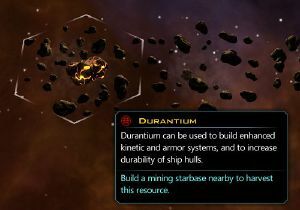 Each resource allows you to build special, powerful components on prototype ships or special, powerful social buildings on your colonies. 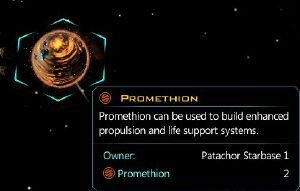 Synthetic (Yor) and silicon (Slyne) civilizations are especially dependent on resources, since synthetic civilizations require durantium and promethion to manufacture new population, and silicon civilizations require promethion to construct cities to support larger populations.